Nicole's Needlework: Raspberry Patch finished! Raspberry Patch finished!, originally uploaded by nevillen. 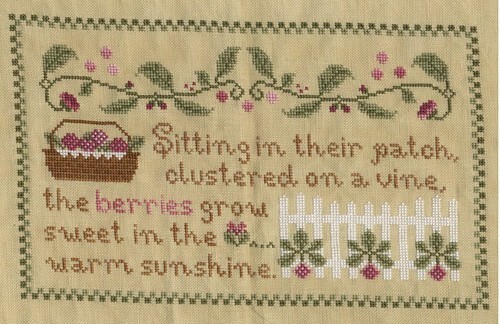 Pattern: Country Cottage Needleworks - Raspberry Patch. Fabric: 32 ct. R&R Sheeps Straw Linen. Threads: DMC, Weeks Dye Works, and Crescent Colours. Started 8/26/06 - Finished 9/18/06. Now I'm trying to decide if I should finish something I've already got started, or start something new?? :) Maybe I'll do both! Congrats on the new finish, its a beauty!! You have done a really beautiful job on Raspberry Patch! You inspire me! I wish my Queen of the Needle was done, but it is a fun one to do as well. I will probably start a small scissor fob, but then want to try to finish my Queen of the Needle. So much stash, not enough time sometimes. It looks lovely! Congratulations :) Their designs are all so pretty - I don't think there's one I don't like LOL! Congratulations on your finish, its so lovely. Oh, Raspberry Patch is awesome! You do such a wonderful job stitching these up. I can't wait to see the next one! Ann.